We used the Underground to get around London a lot on our most recent trip. I find it unnerving. The New York City subway and the Paris Metro don’t faze me in the least, but there’s something about the deep descents and the constant crush of commuters pressing always to the left instead of the right that make me uneasy in the Tube. There are so many stops and so many ways to get lost. And Teddy seemed so small and precious as I clutched his hands while we dashed through tunnels teeming with people and rode down dizzying escalators. I’d rather ride the bus when it comes right down to it, even if it means sorting out which roads are closed for construction as so many of them are while London gets ready for the 20212 Olympics. Come to think of it, I most preferred riding a bicycle. Maybe that’s how I’ll get around the next time I’m in London. But even if riding the Underground isn’t my favorite activity, like everyone else, I find the iconography irresistible, from the tiled walls to that bold red circles to the charming and sometimes mystifying stop names (Tooting Bec anyone?). 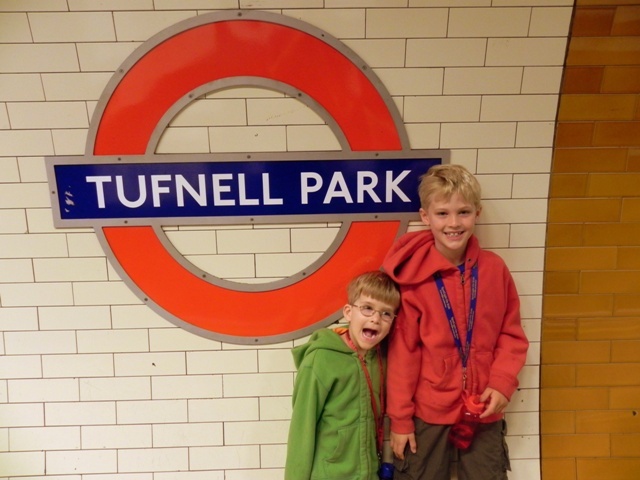 This photo was snapped at our “home” Tube stop, which was right up the street from the apartment we rented. It has been a while (a long while) since I visited London. But I remembered enjoying my ride on the Tube. Unlike our recent metro ride in NYC, I found it a bit too dingy to my liking. 🙂 But I could see while you will enjoy riding the bike than the Tube. Reading that post, make me want to do the same! I love the Tube! I like it better than the Paris Metro, for some reason. It makes more sense to me — I don’t know why. We “lived” near the Bayswater station on our recent vacation, and the kids were pros at it by the end of day 1. As far as names go — when we were in the UK years ago and went up on the train to Stratford upon Avon, I remember one of the stops was Leamington Spa and I just LOVED that name. The look like they love the underground, but you are right I would prefer bike riding. Oh no, no, no – on the bus you don’t know where to get off or where you will be! But you do with the Tube – I have been known to actually head to the closest Tube station when lost to orientate myself! We love the London Tube, Paris Metro, New York Subway and every great cities mass transit. It’s such good learning for kids too. I hear ya on grabbing the little ones hand as ours was just 5 when we began our open ended world tour and she had never taken a subway or even a bus before we left in 2006. Subways & escalators can be crowded & scary with fast closing doors & pushing people. ( I could not use the tube when we were in London last year soon after I had surgery on my arm from my bike fall, I was too fragile for the crowds). Now, at 9, you can hand her a map and a subway map and she could find ANY place on her own in Paris, London or New York City…actually anywhere. She led us often during our recent stay in Paris & will again when we get back to London in October. Of course buses can be fun too sometimes if traffic is not too bad and we love to bike and walk a LOT too. Amy – Yes, the NYC subway is dingier. But you don’t usually have to walk so far to get to the platforms! Lisa – I think because I lived in Paris for nine months, the Metro feels comfortable and familiar to me. And again – you don’t have those long escalators. I don’t like long escalators! Arrows Sent Forth – Oh yes, we do love “mind the gap” – and of necessity said it to Teddy every time he got off the train. Another nightmare was of his foot getting caught. Natalia – my experience in London has been that many people don’t realize how close together things are because they only know their relationship to each other via the Tube. I’ve been told to take the Tube rather than go on a 10-minute walk in Central London and I’ve become convinced that’s because the person telling me has only ever gotten from Point A to Point B underground. I like the bus because I get a visual if you know what I mean. Soultravelers3 (nice to see you again!) – Does Mozart love to read the maps? Tommy does too and did in Paris as well. He makes a game of it and liked to figure out routes from one place to another. The mazes of the Tube/Metro/NYC subway make me feel like I’m truly a traveler. It was interesting to read about the history of the maps too: the Underground system isn’t a true geographic representation of what happens in the “upper realms”: so that’s why you can wander in tunnels for 20 minutes when stops are only three blocks apart! You look like you’re all having such a great time on this trip! I wish riding a bicycle was a viable option more often when I travel, too. @natalia – actually now the London buses have constant announcements so you do know where to get off! “This is the number 3 to Oxford Circus. Imperial War Museum!”. Etc. Drives you mad but very useful on routes you don’t know. I live in London with a toddler & obviously the tube is second nature to me. I found the Paris metro a real pain last weekend, because very few of the gates allow a buggy through – fine if there are two of you but difficult to restrain toddler & lift buggy over the gates by onself. Then all those steps! With an escalator you can wedge the buggy on & sail down, but those long flights of steps again make it really hard for a parent travelling solo. Cheryl – I just checked out that post – soooo funny because my boys also think that “tooting” (which is what I taught them to say for passing gas) is hilarious. It is so sweet to see you writing like that about a “big” boy – I certainly hope that my two grow up to be like yours. 23 hours ago by motherofalltrips Window, Mystic.